Wales prop Rhodri Jones has made his comeback after more than 10 months out through injury. 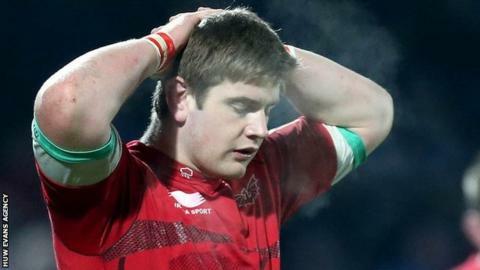 Jones, 23, played the first half-hour of Llanelli's 30-24 home defeat by Newport in the Welsh Premiership. He suffered a dislocated shoulder against the Ospreys in January and was later ruled out of World Cup contention by a pectoral muscle injury. Centre Steffan Hughes, a former Wales under-20 captain, played 50 minutes on his comeback from a knee injury. Jones' return could boost his chances of making Wales' 2016 Six Nations squad and adding to the 13 caps he has already won. The result took Newport to the top of the Premiership table.